A great gift idea for anyone young at heart! Available in hard or soft cover! Catherine's Castle - A free online book for mature teens and young adults. Visit CityCastles.com for greeting cards and more. Arthur Collins spends most of his time hiding. He hides from his embarrassing family, his scary teachers, and most of all, the Ruffians. He hates being a coward, but what else can he do? 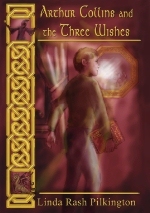 Arthur is magically transported back to the time of King Arthur, where he is the only one who can stop an evil plot. But first, he has to convince the great Merlin that he was sent from the future to help. Will Merlin believe his incredible story? And together, can they defeat the mysterious enemy who wants to destroy the kingdom? Find out by getting the book!